I'm an artist and writer who lives in the Appalachian foothills of Ohio. With this blog, I hope to show what happens when you make room in your life, every day, for the things that bring you joy. Strange...most of them are free. Sandhill Cranes Need Your Voice Now! Sat. Mar. 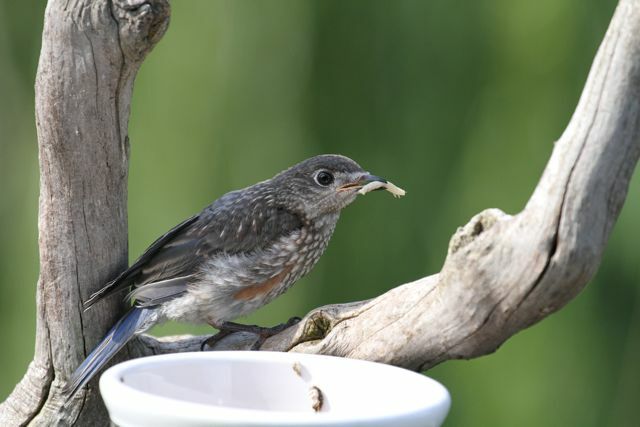 2, 2019, 11 am: "Baby Birds: An Artist Looks Into the Nest" with booksigning at Amish Birding Symposium 3735 Wheat Ridge Rd. West Union, OH 46593. Amish lunch afterward. Tues March 26, 2019, 7 pm: "Baby Birds: An Artist Looks Into the Nest" with booksigning at Columbus Audubon Society Grange Insurance Audubon Center, 505 W. Whittier St., Columbus, OH 43215. Wed. June 5, 2019: Julie Zickefoose, "Baby Birds: An Artist Looks Into the Nest" at Three Rivers Birding Club, Phipps Garden Center, 1059 Shady Avenue in Shadyside, Pittsburgh, PA. Doors open at 6:30 PM for socializing, a business meeting begins at 7:30, and the program starts at 8:00. It's been a long and lovely road with the bluebird trio. I'm writing on August 8, and we still have two of the orphaned girls (Elsa and Ida) coming in many times daily for mealworms. They're 57 days old. Toddy stopped coming in around Day 52. She took fewer and fewer worms, got wilder and wilder, and decided she didn't need us any more. Elsa and Ida are another story. They'd come in and gorge while Toddy watched. And then Toddy would come alone, and then she stopped coming in altogether. Elsa and Ida are inseparable (always were). And they do everything together, like the Bobbsey Twins. It's always been two and one with this trio. Girls can be like that. So it wasn't a huge surprise when Toddy took off alone. Toddy, around when she took off. We miss her. She is a badass little bluebird. Always took the lead, picking up her own food first, letting the others figure it out for themselves. Of course, I love having them around. I'm the mom who wants her kids to go to the local community college and live at home. That is, if they're birds. If they're human, not so much. As you might surmise from the time elapsed (I got them July 7 when they were 25 days old) it has been a thing, getting these babies launched. And I was just getting to the point where I didn't need to feed them every hour, and they were learning the ropes around the yard, and I was beginning to exhale. 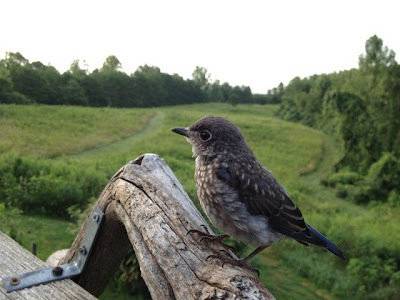 So imagine my dismay when, upon awakening July 28, I heard incessant and mournful calling from an abandoned nestling in the front yard bluebird box. Three siblings had fledged from it the evening before (in a rainstorm). 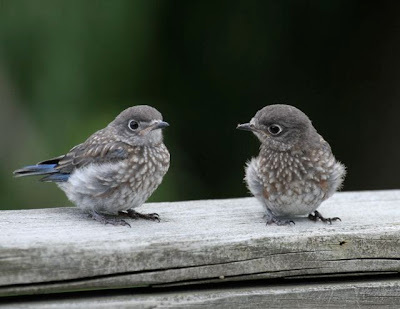 I don't know why bluebirds so often choose rainstorms in which to fledge. They just do. So here's this little one, the next morning, and she's all alone. I'd been watching her straight through. She hatched two days after her siblings. Right there, that's abnormal. I couldn't believe it, in fact. And she stayed small all through their nestling period. And sure enough, when the rest of the birds left, she was left behind. 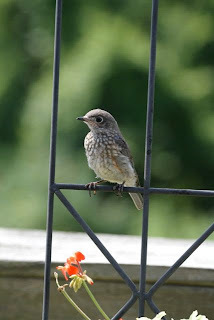 Generally the adults will come back and feed such babies, so I left her be, and hoped her calling would bring them back. No dice. Not a sign nor a sound from the family. They had departed. The next time I saw her she had finally leapt from the box and was hopping around in the garage under my car. Oh no. Please. 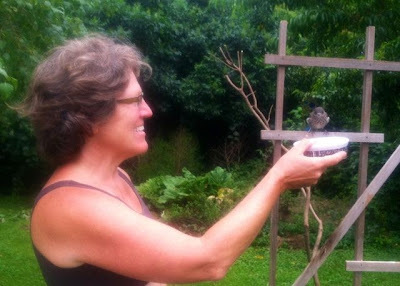 Just coming off this experience, I reeeally did not want another 45 days of indentured servitude to a bluebird. But she was starving. So I fed her. And although she was terrified, it only took one feeding, and she started gaping for all she was worth when she saw me. Yep, she's my problem now. 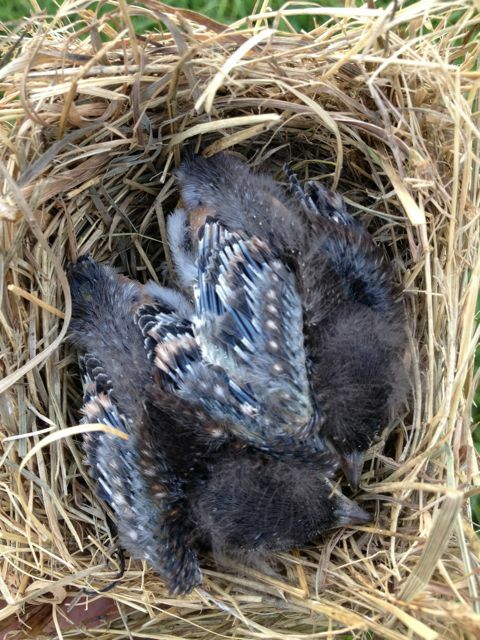 First move was to call my buddy Jeff and see if he had any same-age about-to-fledge babies in his boxes. He didn't, but he showed up to help anyway. 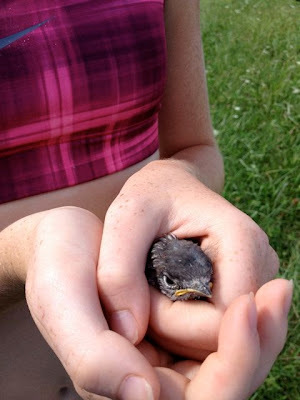 It's a very delicate thing, to try to integrate a jumpy fledgling into a box of jumpy about-to-be-fledglings. Still, if you can get it put in and if it stays, the parents will feed this miracle baby in the box and they'll feed it after it fledges, too. I call it cross-fostering. 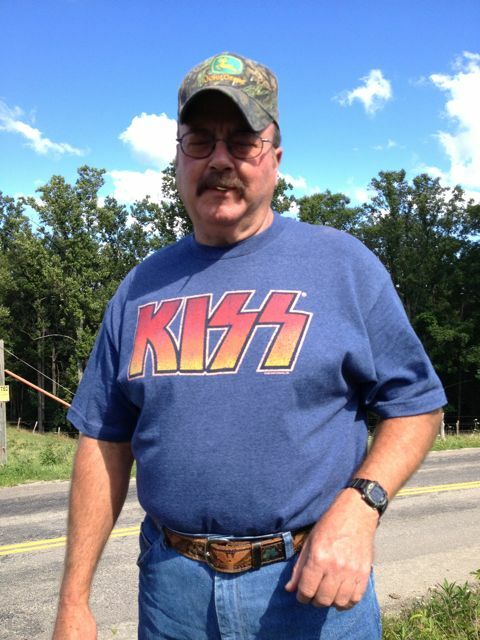 I liked the combo of camo and Kiss. He's seen them twice. Not bad for a cowboy. I loves me some Jeff Warren. Phoebe and I fed the baby overnight and all the next morning until she was strong and ready to go...somewhere... and I studied on it and thought and finally realized I had a box with babies who were the same age as her (although I'd assumed they'd fledged by now) and I might as well try to slip her in there. If they were still there... Here they are at day 11, when I had last checked them. Now, as I thought about it, they were Day 16. Yikes. Might already be gone. So Phoebe and I saddled up and went over there and met Jeff. I took a sock with me to stuff in the box hole in case they all exploded in my face, being so ready to fledge. Carefully, I opened the box, and there were two pairs of bright eyes looking back at me. Eureka!! The twin brothers were still there! Do you want a little sister? As if they had a choice. I closed the box and started to stuff her in the slot hole entrance. She took one look at the nest, her new brothers, and actually climbed right into the nest. I could feel her relief at being with bluebirds again. It might have been as great as mine. Just to be safe, I stuffed the sock in the entrance, but there was only silence from the box. We stood and chatted awhile, then Phoebe and I drove our car well down the road and watched through binoculars until we saw both adults come to the box with food. And then we drove home, elated that we'd successfully pawned this little girl off. We wouldn't have to raise her. And she'd grow up a bluebird among bluebirds. who is doing fine anyway with her sister Elsa in their great big backyard. They have brought us great joy. And they're begging at the window as I write. Thrushes have a particularly hard time saying good bye. photo by Wendy Clark. Never mind the radioactive glow. I think it's happiness. Oh, man. What a great post. What a great story. Mazel tov and tons of love! Xxoom. I'm glad there was a happy ending with that young lady. There's just something about those big eyes and that spotted breast that's so attractive on young Bluebirds. I admire your work with the birds especially their environment looks so harmonious and peaceful. I love waking every morning to the sound of birds outside my window and the cooing of doves. Love this. Love your flexability. May letting go be as easy next fall! © Julie Zickefoose, Indigo Hill Arts. All rights reserved. If you like what you see, and are tempted to lift something for your own use, you need to contact me and play Mother May I. Extra points for genuflecting and offering recompense, linkage, and obsequious tribute. If you reproduce my photos, art or writing without asking, I will track you down with my Googlehounds, and you don't want that. Aooooooo!